The series of jagged faced ridge line known as The Needles, located on the northern fringe of the Southwest National Park provides the setting for one of the most rewarding, and seemingly unknown, short walks in Southern Tasmania. Accessed via Gordon River Road, this short 3km, 2 hour return walk offers uninterrupted panoramic views from rugged mountainous terrain with minimal physical exertion required. View Google Map Directions From Hobart, head north-west on the Brooker Highway (A10) to New Norfolk. Once at New Norfolk, follow the winding road of B61/B62, passing Mt Field, Tyenna and Maydena. 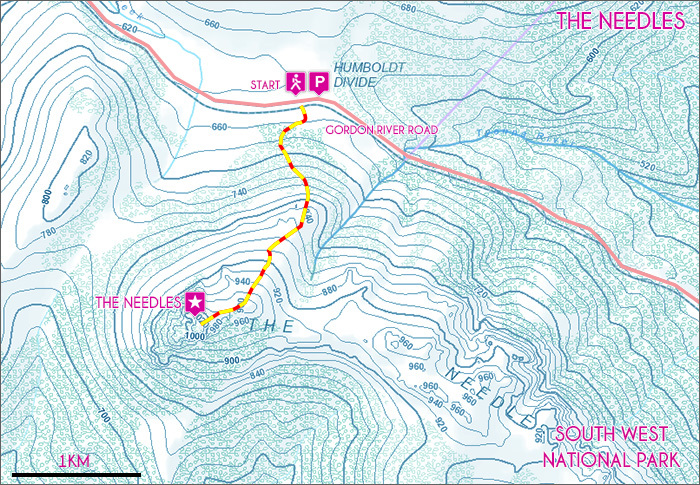 The trailhead is found directly opposite the ‘Highest point on Gordon River’ road sign, 16.5km past Maydena. The carpark is located on the right hand side of the road. The Needles trail starts at the car park signposted as the highest point of Gordon River road (elevation 651 metres). The trailhead is found 10 metres further west on the opposite side of the road and is clearly marked by cairns. Once on the track, pink and green ties will quickly direct you through bush scrub to the walkers logbook and the continuation of the track, a sharp right about 20 metres in. From here the walk is a constant but manageable climb of 400 metres spread out over 1.5km through to the final summit. During winter, the initial sections of the track may be quite boggy and careful footing is required. The impressive size and ominous nature of the Needles is soon realised as the harsh grey face of the first needle like outcrop comes into view directly above you after passing through the lower hillside section of the walk. Beyond the first outcrop the trail is extremely exposed with little vegetation to provide protection from the high winds that frequent this area. The trail continues to climb up a series of natural steps for another 30 minutes, passing by a number of smaller outcrops before reaching the summit point (1020 metres). From the top, your climbing efforts are exponentially rewarded with vast uninterrupted 360 degree views; Mt Mueller and Mt Anne to the south, Mt Field West to the north and glimpses of Lake Pedder and Gordon to the west. Return via the same track. Although not recommended for inexperienced hikers and climbers, a series of overgrown, unmarked and at times challenging alternative trails lead east from the saddle below the summit following the ridge line of the Needles to their end. High winds and slippery conditions can make this trail challenging at times. Similarly, like any alpine walk in Tasmania weather can change quickly and dramatically. Be sure to pack suitable clothing for all weather conditions. There are many steep cliff faces along the Needles, take care if traversing to edges and summits.